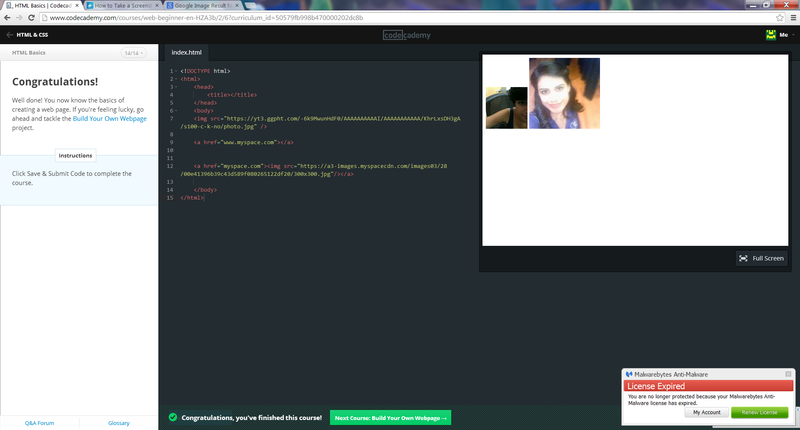 My First Coding Experience Ever! Code Academy was so great because they break all of these steps down in easy ways that allows people who aren’t very tech literate to still understand how to use a number of different programs. If you have any problems, Code Academy will check your work and offer suggestions as to where you might’ve had problems (assuming there are errors in your work). As I mentioned earlier, I was afraid to get into coding because I thought it would be too overwhelming. 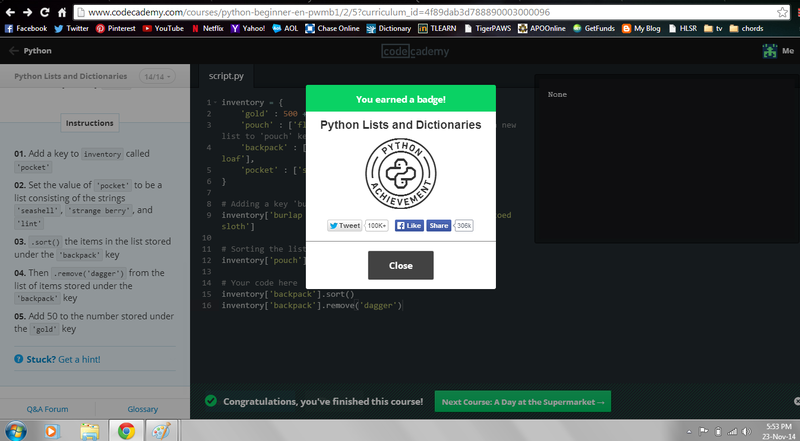 After my experience with Code Academy and Java Script, I think I want to go back for more. In our class, we have talked about the importance of knowing how to code. Now that I have seen it first hand, I couldn’t agree more. For any and all persons who are thinking of getting involved with coding I strongly recommend you visit Code Academy. I was a novice and I felt comfortable with the way the language was presented to me. Code Academy offers a number of different programs you can learn about, whether its HTML, Java Script, CSS etc. Whatever you are looking for you can probably find it at Code Academy. I recommend you try it for yourself, and I think you will have a similar experience to that of my own! 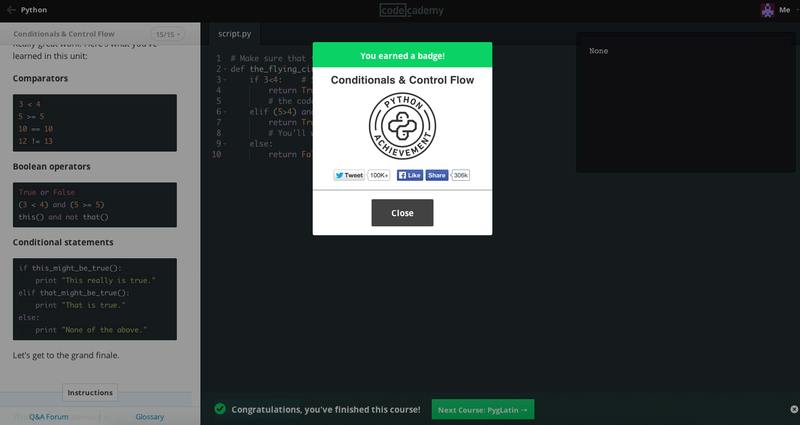 I had had no prior experience when it came to coding before I tried CodingAcademy. To be honest, I thought learning how to code was going to be extrememly difficult, but I was pleased to know that it is possible to understand by using basic math and reasoning. I would definitely consider trying out other tutorials on the website. 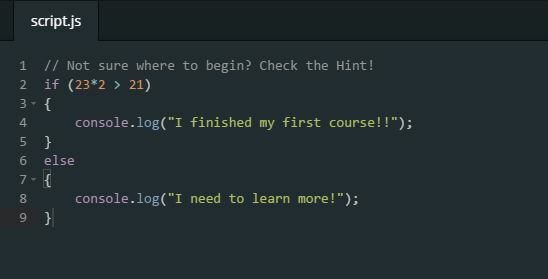 The tutorials are a great way to get started on coding and to forget about the fear that comes along with learning something that seems so complicated. I would definitely recommend it for everyone. When it comes to coding I am an enthusiastic beginner! As an aspiring computer science major, working on Code Academy is nothing new to me. This time around—because I have very basic practice in Scala and HTML—I figured, “what the hay” and tried something completely new: Python. Python is awesome. And while some of the different assignments made more sense to me now with a semester of CS under my belt, I thought the course was intuitive and well paced. Things like comparisons and Booleans may have seemed daunting a few months ago, but the course did a really good job of taking me through each step and explaining each action. I loved working with the tutorial, but I don’t think any online service will ever replace learning from an experienced and caring teacher, especially if you have absolutely no experience (like me at the start of the semester!). I definitely plan to complete the Python course and I am really excited to take more beginner courses like Ruby and jQuery on Code Academy. While I really enjoyed what I’ve done for Python so far, I do think this is because I have had formal teaching in CS in school. Certain actions came easily to me because I have done it before. So if I were to recommend this to a friend it would most likely be one who already has some basic coding experience or one who is looking for a fun challenge. People should not be deterred from coding just because it seems like it is hard. Coding is fun and with the right teacher or course anyone can learn something new! Prior to this assignment, my experience with coding would probably lie somewhere on the scale between beginner and intermediate, but probably way closer to the beginner side. I am currently in Intro to Programming, in which I have been learning how to code using the program Processing. I’ve heard that Processing uses a bit more difficult language than Python, so I decided to try learning Python this time around to see what the similarities and differences are. It started off easier than I thought it would be, as many of the logic concepts and syntax were similar to that of Processing, but as I continued it got to be a bit more complicated. The logic was starting to get a little confusing, but the examples in each step really helped out a lot. I especially liked the way in which the lessons were set up to relate to practical situations in which you can use coding in real life, such as going to the grocery store or planning a trip. Many people think programming is only useful for people who build massive, complex software programs, but these tutorials showed how you can incorporate it in your own everyday life. I definitely want to continue this tutorial and start tutorials for other programming languages through Code Academy as well. I felt really motivated while doing this and continued coding past just 90 minutes; I think I’m 40% of the way through completing the Python tutorial. I looked at the profile the website creates for you, and I liked seeing how many badges I had earned and noticed that they have a “streak” count, showing how many days in a row you’ve been coding. I want to try coding a little bit each day so that streak doesn’t go back to 0. I would definitely recommend Code Academy to my friends, my parents and my siblings, even if they don’t know they are interested in learning to code. Many kids take keyboarding tutorials in school, but very few take coding tutorials, so if they want to learn how to code it is a skill they have to learn on their own later, and this is a perfect way to do so. 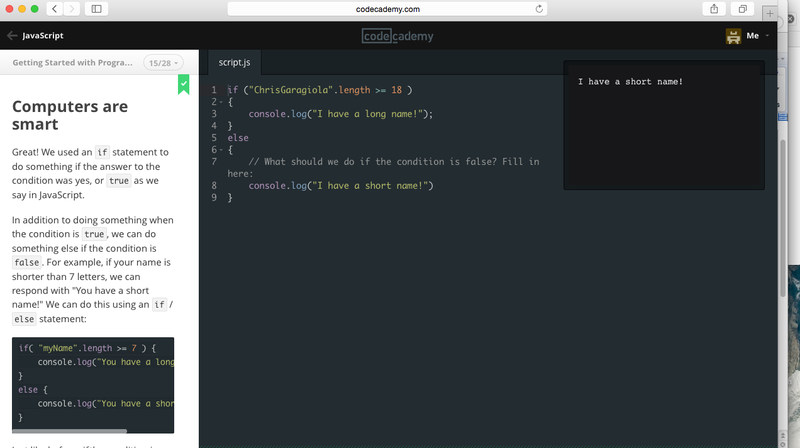 I think people with very limited coding experience or none at all can still learn from Code Academy because it explains everything very clearly and you cannot move on to the next lesson until you’ve correctly coded each step within your current lesson. I do not believe I have ever sat down and learned a lick of any computer language. Or if I had some time in the past, I was unaware that I was “coding”. All I remember from computer class in preparatory school was a lesson plan which incorporated a program that had a turtle on a white canvas. In this program, on the right hand side of the screen, there was a bar of tools and a box for typing in commands to make the turtle do actions. For example, I would tell the turtle to take ten steps forward, turn ninety degrees, and walk forward twenty steps. I just remembered speeding through the lesson so that I could play the Sonic Underground game. Honestly, I remember that game and collecting rings more than the computer lesson, unfortunately. 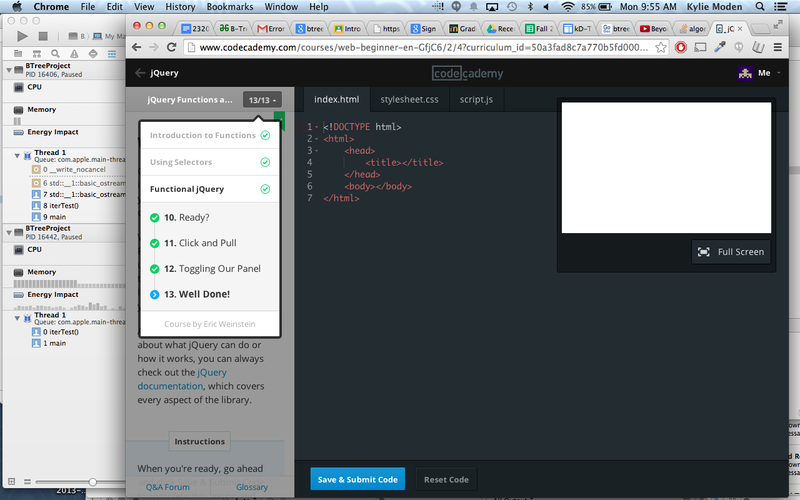 I really did not have any expectations when deciding to tryout coding through codeacademy.com. I just thought it would be a challenge learning a new language as it is with all languages. After completing one segment of the “Introduction to Ruby” course, I am confident that it is doable—it just takes time and effort on my part. During the process, I had to retrain my logical thinking patterns to the Ruby language, I did have questions and wondered if I was able to do more sophisticated commands but my coding showed up syntax error when I did. Baby steps, it is just the beginning! What this lesson taught me was that programming language has many rules that follow certain logic. Once that logic is grasped the whole language can be mastered with tremendous amounts of practice. This site made it so easy, especially because of the user-friendly interface, to learn that I immediately texted my brother, who is one year younger than me, and told him to learn any programming language he wanted! 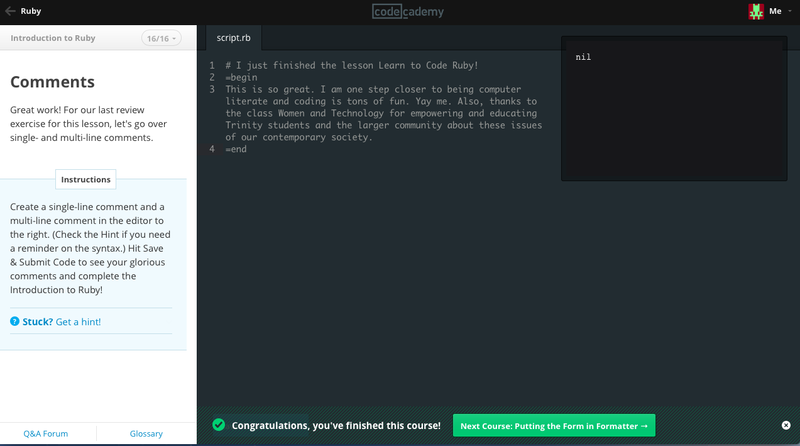 I definitely feel the urgency to learn some coding and I was apprehensive at first because I did not start earlier with a formal computer class at Trinity, but this process was easy enough and I certainly will continue with the lessons during my spare time. It is absolutely free so why not? God bless the people who created this brilliant website. Starting out the coding lesson, everything was new to me. I had never before attempted to code. The tutorial I chose was HTML & CSS, because it seemed just a tad bit more familiar than the others were (I had seen “HTML” before…somewhere). I actually found that the programming language was easier than I had imagined it would be. In the HTML course, the instructions were pretty straightforward and had helpful hints to enlighten me along the way. 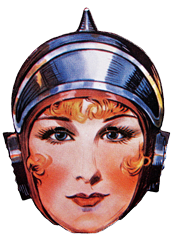 Much of the terminology was pretty literal and obvious like <head> or <body> for headings and body paragraphs. I would actually like to continue using this site and take a crack at building my own website. I found it to be extremely helpful and it could be a potential skill for future employment. The instruction is pretty plain and easy to understand. I would definitely recommend Code Academy to anyone who is just starting out, especially for my friends who already have some sort of understanding when it comes to computers. It might be little difficult for my parents to understand because there is already an expected level of computer knowledge. For my parents and others like them, they may want to start out with a computer literacy class first.